When Is the Right Time To Step Down? “Maybe I’m the emblem of an old era,” who shouldn’t be leading Microsoft forward into the new one, Ballmer told the Wall Street Journal. So, in one of the highest-profile CEO searches in many years, the Microsoft board is looking for someone who might be able to help the company wrest back the mantle of digital leadership from Apple – or at least make Bill Gates’ revolutionary startup a feasible rival again. Like Ballmer, many other CEOs have volunteered to walk away; still others have been pushed out because they didn’t choose to leave soon enough. The different ends to their tenures affect everything from the former chiefs’ career legacies and eligibility for board membership in retirement to their income in retirement. Priceline CEO Jeffery Boyd is another CEO who recently said he’ll leave peaceably, announcing that he would hand over the reins of the online-travel company to a current head of a subsidiary. Like Ballmer, he faced an uncertain and ever-shifting digital landscape. But unlike the Microsoft head, Boyd led his company on a decade-long trail of redemption, leveraging a series of acquisitions to restore Priceline to its former glory after the bursting of the dot-com bubble had laid it low. Boyd will remain chairman of Priceline. But making even Ballmer’s swan song look melodious was the departure of Janet Robinson nearly two years ago as CEO of New York Times Co. She was unable to stay ahead of the tectonic shifts in the newspaper business and the particular pressures at the family-owned Times. And so while it left a leadership vacuum for a while, Chairman Arthur Sulzberger Jr. pushed Robinson out, eventually filling her post with new CEO Mark Thompson, an old BBC hand. The ways of departure of at least two other high-profile CEOs remain up in the air. General Motors chief Dan Akerson has indicated he could step down sometime next year. GM hasn’t begun a formal search for his replacement. But Akerson – a mold-breaker, as a former telco head-turned-chief of the auto giant — has begun providing some clues for the type of person he’d like to see follow him. “Have the humility and audacity to say ‘I made a mistake,’ and back up and go down the other way,” he said. McDonald’s CEO Don Thompson actually may not be thinking about a personal exit strategy, but the company’s woes may bring him – or its directors – to that point sooner rather than later. The world’s largest fast-food chain has been slumping, and projections don’t look that great for 2014. So Thompson is keeping his nose to the grindstone while he looks for a major maneuver that could help return McDonald’s to the momentum it enjoyed before he was given the job. Other experts argue that a change in leadership is only partly an answer if the fundamental strategy it at odds with where a company’s organizational capability may be in its life cycle. Commenting on Ballmer, Harvard’s Clayton Christianson says, “They have had a great CEO who was great at running the existing business. 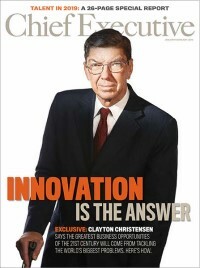 What they didn’t appreciate is that when you want to catch the next wave of disruption you cannot do it from within the existing business and beat existing players in their own game.” Disruptive Innovation author Christianson thinks simply changing the CEO often is simply not enough.